EDGE Boost Pro Plus 7mm SSDs are TAA compliant, built with premium SandForce controllers, and backed by a superior five-year warranty. Offering large storage capacities with exceptional performance, the EDGE™ Boost Pro Plus 7mm Solid State Drive (SSD) is a premium storage upgrade solution for servers, desktops, workstations, and notebooks. Designed as a direct replacement for traditional spinning disk hard drives (HDDs), Boost Pro Plus SSDs are faster, lighter, quieter, and more reliable. Utilizing high-performance Synchronous NAND flash, Boost Pro Plus SSDs do not contain moving parts, making them a more durable storage solution than a spinning disk HDD. The Boost Pro Plus 7mm SSD achieves ultra-fast read and write speeds from a premium SandForce controller. Performance gains associated with system start up, data access, application loading, and backups are immediately realized upon installation. Additionally, Boost Pro Plus SSDs consume less power per transaction than HDDs, resulting in a desirable blend of performance and efficiency. AES hardware encryption comes standard and secures 100% of data when enabled. * The feature-rich SandForce controller enhances stability and reliability with support for TRIM, S.M.A.R.T., Garbage Collection, Wear Leveling, and ECC. SandForce exclusive functions - DuraWrite and RAISE - further improve data efficiency and increase the lifespan of the SSD. Boost Pro Plus SSDs are compatible with many popular operating systems, including Windows, MAC OS X, and Linux, and work in both SATA and SAS** environments. With savings on power and cooling costs, increased performance, and improved durability, upgrading to the Boost Pro Plus 7mm SSD is a sound investment. 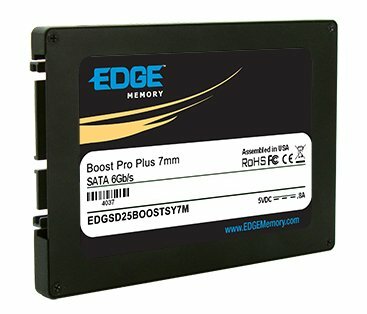 EDGE Boost Pro Plus SSDs are backed by a five-year warranty***. **Will function in a SAS environment but will not have SAS specific features. Exceptional Performance- Utilizes high quality Synchronous NAND flash. Substantial performance gains in data access, application loading, backups, and more. Extreme Durability - No moving parts - more durable and reliable than traditional hard drives that use a spinning disk. Improved energy efficiency per transaction. Low Profile - 7mm height allows for perfect fit into notebooks and Ultrabooks. Compatible with desktops, workstations, and servers.